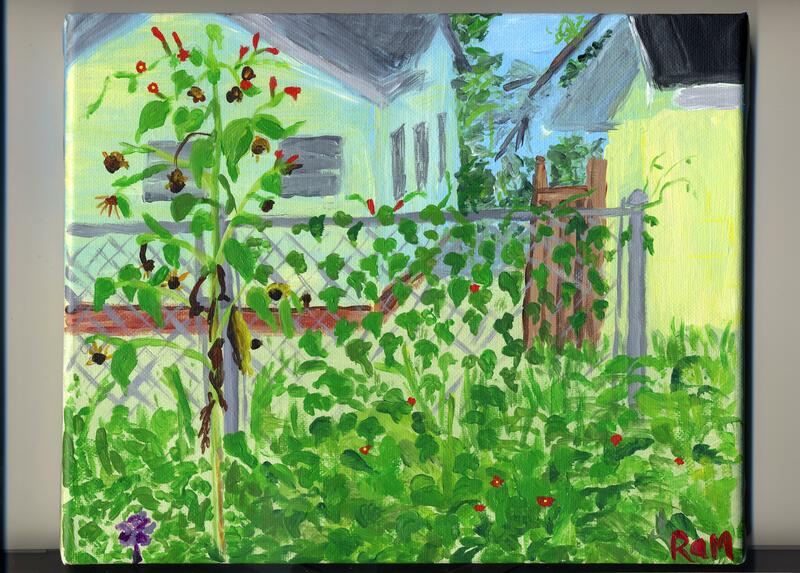 Painting outdoors in July in Florida is something that has to be carefully planned. You can’t just grab your paints and head out any old time of day. Afternoons are pretty much impossible, either because it’s too hot or because it’s too wet. It might be both. This is July in Florida, after all. Noon is for lunch and coffee and I’m not ready for nocturnes, so that leaves mornings. Unfortunately, my tie-dye day job also requires working outdoors in Florida in July. I have to balance my schedule because there are still people (kind, patient, wonderful people) waiting for things they ordered in May. I need to dye and I want to paint. I was able to take a morning for painting last week because my daughter was still tying things. I still haven’t left my own back yard. This is a pine cone lily that grows in the shadiest corner of my back yard. There is also a log, a fence and a wild azalea plant. The background is my neighbor’s garage. That’s what’s back there, so that’s what I painted. I like this painting better than the one I shared last week. I can see progress and that makes me happy. The next one makes me happier because I can see more progress. Yes, it’s my back yard again, but it’s not the shadiest corner. The day started out overcast, so I figured I could paint this little garden bed without worrying about shade. I had been wanting to paint it since the vine with the heart-shaped leaves and tiny red flowers started to take over. I mentioned this to my husband and he said I’d better hurry because that vine was a weed and he planned to clean out the bed, wilted sunflowers, adorable vine and all. I hurried. Forgive me, kind, patient, wonderful special-order tie-dye customers. That could have been dyeing time, but I took it for painting time because I didn’t want to lose my chance to paint that overgrown garden bed. 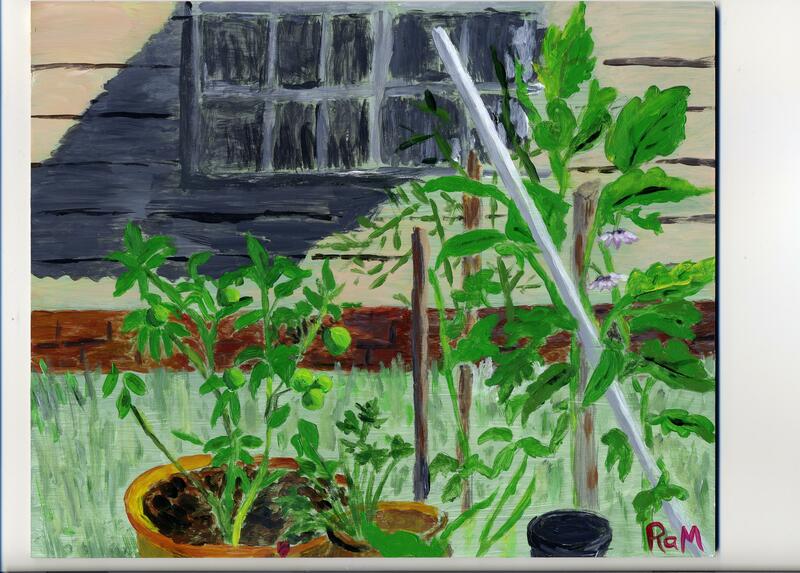 This entry was posted in Uncategorized and tagged back yard, garden, painting, tie-dye on July 29, 2015 by releaf1954. I am happy to report that, even after my disappointing effort last week, I did paint this week. In fact, I painted twice. 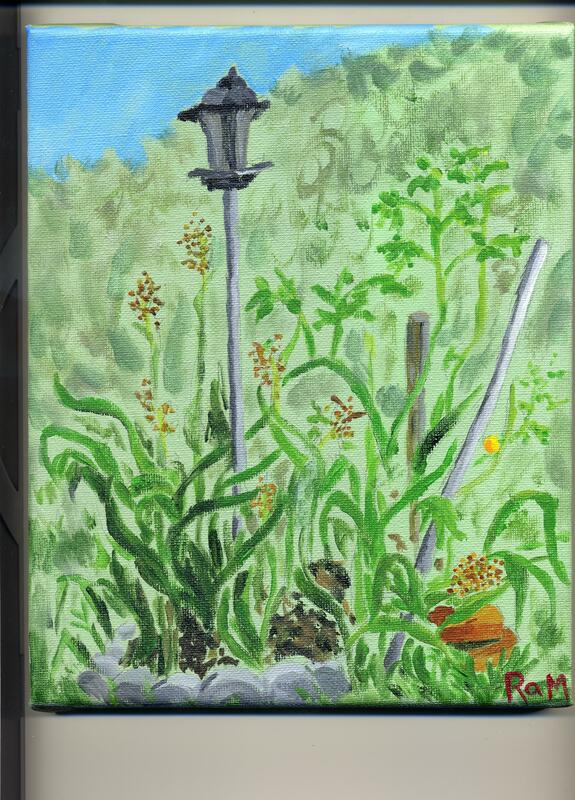 I stayed in my own back yard and I started with a tiny canvas, but I took my paints outside and I painted. Out there. En plein air. Eventually, I would like to try a sweeping landscape, with some real sky and all, but I am trying to proceed at the speed of me and this feels about right. I need to get used to painting outside. I need to figure out which colors are indispensable. I need to figure out how long they will stay wet. I need to figure out how much to include in the background and how to make it stay in the background. I think I made some progress with this tiny painting. I wanted to paint the little purple cabbage in my husband’s garden, but I remembered last week’s problem with the background, so I started with that. What’s behind this small garden is my neighbor’s garage and a chain-link fence. I tried to put them in lightly, without too much detail. It’s still not perfect, but it’s certainly an improvement over the “background” I painted last week. I love the little cabbage and the friendly plants next to it. 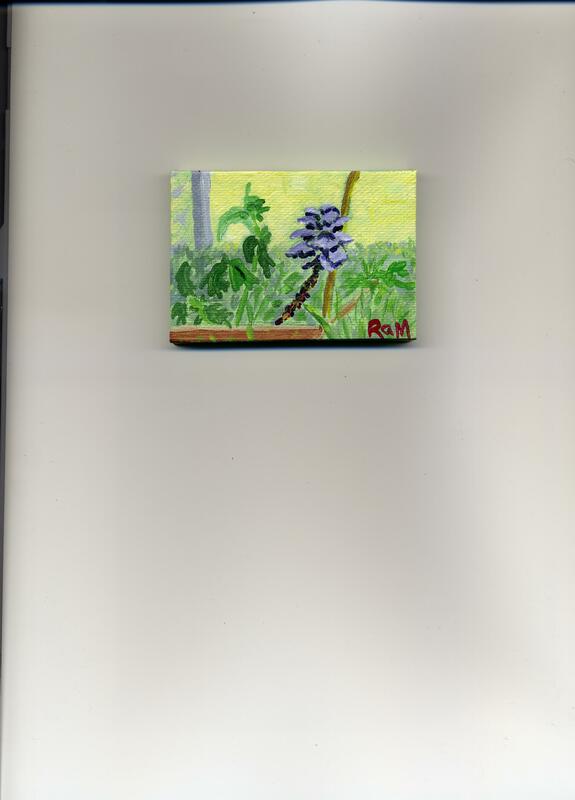 I was encouraged by this tiny effort – it’s only 2 1/2” by 3 1/2” – so I tried something a bit bigger the next time I took my paints into the back yard. I obviously bit off more than I could chew, but there are a lot of things about my 8” x 10” painting that I like. I like all the pots. I like the eggplant blossoms and I like the strawberry and I like the limes. I hate the window and the shadow of its awning. I just couldn’t figure out what colors I was seeing in those window frames. They were in shadow. I knew what color they really were, which was white. Of course they don’t look white when they’re in shadow, but my left brain just wouldn’t let it go. Sometimes I can’t believe how tenacious my left brain can be. It always wants me to paint what it knows is there, instead of what I see. I will keep trying. Every attempt teaches me something. I put my chair down in a big shady spot when I started this painting. I looked up to see where the sun was and it was behind a huge tree. It looked as if it would stay behind that tree for hours. I guess it did, but not enough hours. Once that sun hit my Sta-Wet palette, my paint did not stay wet. There were other things I might have done to this painting, but I couldn’t keep going. My paints were drying up and there was nothing I could do, with the supplies I had brought outside, to stop it. I guess that means the sun finished this painting. Next week, I hope to make better plans and finish my own painting. 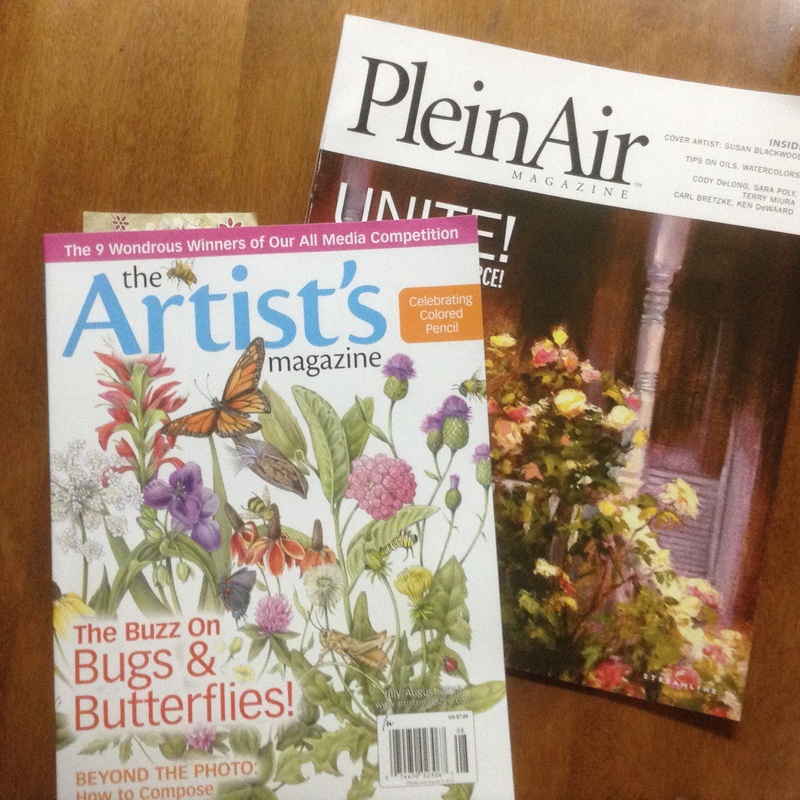 This entry was posted in Uncategorized and tagged painting, plein air, Summer on July 22, 2015 by releaf1954. I had forgotten how much I hate admitting that I don’t know everything. I don’t know how to paint a landscape en plein air. I want to learn. If I’m going to learn, I have to be able to admit that, right now, I don’t know how to do it. I did try it this week. I took my paints into my back yard and I sat down in the shade and I tried to paint what I could see from my chair. I could see the bird feeder and I could see the plants around the bird feeder. I sketched a bit and then I painted. There are so many problems with this painting that I didn’t realize until I was lying in bed that night, trying to get to sleep, that I had not even turned the canvas to a landscape orientation. I painted a landscape in portrait orientation. Well, at least that’s one problem I can easily fix the next time I paint. The others may not be so easily fixed, but I can see them and that means I can work on them. Obviously, the background is impossible. I just didn’t want to think about it until it was way too late to do anything about it. 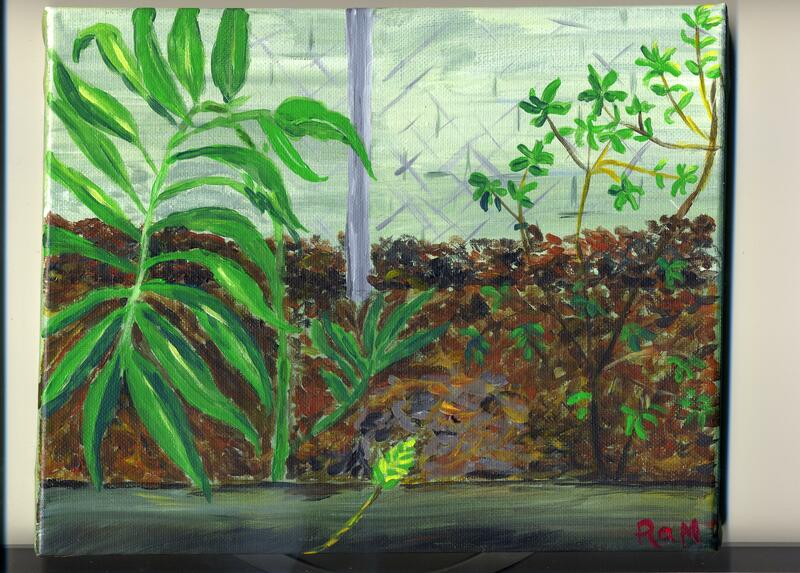 I like painting what I see in front of me, but what was behind the little garden was the big wall of a house. It was not attractive. I didn’t want to paint it, so I just scumbled in a ridiculous mess. Okay, that didn’t work. It’s never going to work. I need to try something else. See? I’m learning. I think the hardest thing for me is realizing that I’m given a certain amount of canvas (in this case, 8” x 10”) and I have to account for all of it. I can’t just do the fun part that jumps out at me the minute I sit down. I have to think, and think fast, about what I’m going to do with the whole space. I can’t just fill it in after I paint the obvious stuff. I need to plan and I didn’t do that this week. I was barely able to make myself carry the paints outside. Even after I carried them out there, I thought about giving up and bringing them back inside. It was a very near thing, but I painted. I am glad that I painted. Next time, I’m going to try to remember to squint. This entry was posted in Uncategorized and tagged painting on July 15, 2015 by releaf1954. My Sta-Wet palette has stayed wet for a week now. I was sure I was ready to start painting again but I kept procrastinating. Well, Saturday was Independence day and we were planning to have our kids and grandkids over for a cook-out, so some housecleaning was necessary. My kids know how I live, so I didn’t have to go crazy and take the knobs off things to clean behind them, but I did want to clear the clutter from surfaces and make the floors navigable for a two-year-old. There was a lot of clutter on my surfaces. It took me days to relocate or toss it, mostly because I’m not good at deciding to toss it. Sweeping the floors was a satisfying task because they definitely needed to be swept. It’s not really much fun to sweep a floor if you do it every day. I know that’s what good housekeepers do but I don’t know how they can stand having so little to sweep up. You have to squint to see if there’s anything to brush into the dustpan. That is a problem I will never have. I had fun sweeping and vacuuming and making the house safer for grandchildren, but I did not manage to fit in any painting time before the holiday. I couldn’t do it on the holiday. I had a house full of people and some of them were small enough not to know better than to grab pretty things I should not have left where small hands could reach them. I need to see my grandchildren more often. They always turn out to be taller than I remember. Well, that’s why I didn’t paint last week. Sunday was a day of rest after staying up late for fireworks (okay, they were on TV, but still…) and Monday was laundry day. Laundry and painting don’t mix. It seems as if Tuesday could have been a perfect painting day, but somehow, painting did not happen. Some bill-paying happened. Some grocery shopping happened. No painting. And then came blog day. This day. Can you even imagine how much I did not want to blog about procrastination again? About not painting? I had to do something but I was still irrationally resistant to painting outside. I needed to take a smaller step. I walked into my kitchen and looked around. I found some tomatoes my husband had brought in from the garden. I set them up in my old painting space and I got out one of my tiny canvases and I painted them. I didn’t paint it outdoors so it doesn’t count towards my total, but it sure felt good to paint something again. I’m hoping this little still life has broken the block. 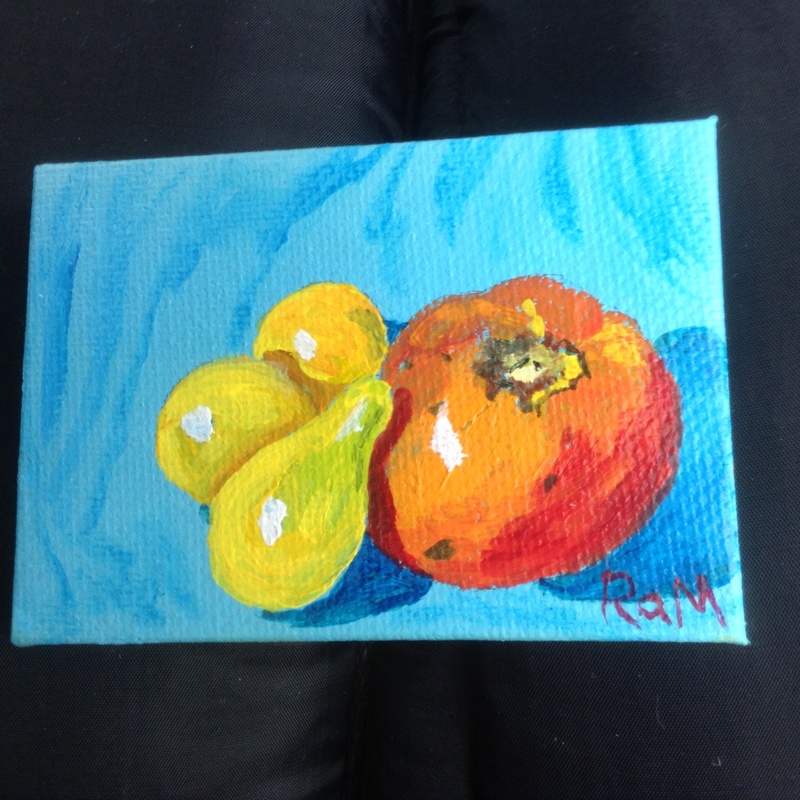 This entry was posted in Uncategorized and tagged painting, procrastination, still life on July 8, 2015 by releaf1954.